The shorter days of recent are reminding me, again, how time flies. I was feeling under the weather there for a while… and now I’m starting to have a little energy again and so things are looking up! One super awesome thing that happened recently is that The Squid Quilt was accepted to show at the Northwest Quilt Expo here in Portland, September 20-22. I dropped it off yesterday, and took my little paper receipt in exchange… it was a bit hard to let go, but I’m so excited to see it actually hanging in a show. It will be in the Portland Modern Quilt Guild area, in case you can make the trip. It’s also the first time I’ve been to the show myself… so there will be a lot of new things to explore. Maybe I’ll see you there! In the meantime… I just keep stitching on the dragon! How exciting! I'm so glad you were able to display your squid quilt. 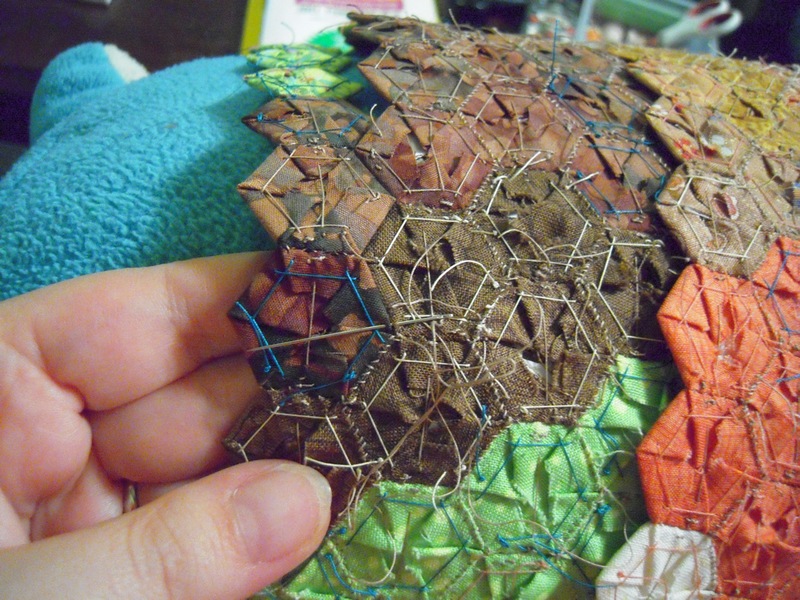 Gail – your dragon quilt is stunning – I do hope you'll consider joining my monthly hexie linky party. next one is 10/17. Oh yay! I'm so glad you decided to submit the squid quilt for the show. Congrats. Will you be going Saturday morning for the PMQG meet up? Way to go Gail!! What day are you planning on going?